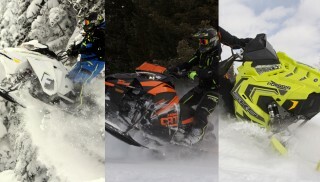 As fans of the new Long track snowmobiles, we decided to compare the two leaders – the 2019 Polaris Pro-RMK 174 850 and Ski-Doo Summit X 175 850. Nineteen model years ago, when Ski-Doo introduced its ZX-chassis Summit X Highmark 151, this journalist pooh-poohed the idea of a mountain snowmobile with a 151-inch long track. After all, for years a 136 was a long track, which gave way to a new popular length – 141 or 144. As model year 2000 passed, in 2005 Polaris kicked out an RMK 900 with a 50th Anniversary special, a 166. This 166 seemed beyond-belief in length. The mountain riding snowmobiler had finally accepted, with great appreciation, the 151/153 length snowmobile, but the 166 seemed out of place. Oh how times…have not changed, actually. Ski-Doo kicked open the super long track wars with its 174 XM Summit X 800, to be followed by Polaris and its 174 AXYS Pro-RMK 800. 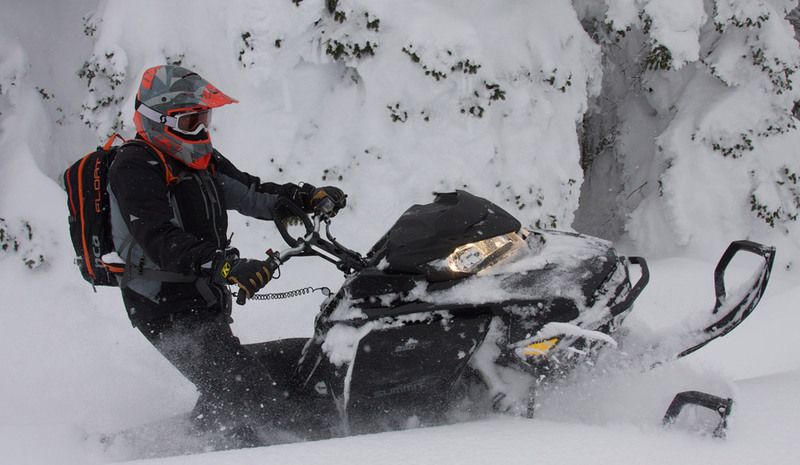 Then Ski-Doo grew its Gen-4 Summit X 850 by one-inch, now a 175, and Polaris came to market in 2019 with a new 850 AXYS Pro-RMK 174 with a new front end. How do we like the super track long track snowmobiles from Polaris and Ski-Doo? We can’t get enough of them. They rock, they roll and they are stable and planted snow critters with a nice and long attitude at being playful and light, to the extent a super long track can be. Given the choice between length and big four-stroke turbocharged horsepower from Arctic Cat and Yamaha (162 King Cat and M-TX LE, respectively), we’ll take super long over boosted horsepower and its weight, though the turbocharged amped King Cat and M-TX LE have excellent power-to-weight ratios at wide open throttle – WOT. Behind this EPA-required exhaust pipe and muffler is a wonderful new 840cc motor, the 850 Patriot, which is state-of-the-art with its internals, coatings, and low inertia. Polaris’ 2019 Pro-RMK 174 comes with the new Patriot motor, which is stronger that its Liberty 800, though in current build, the 800 is not a lazy motor by any means. 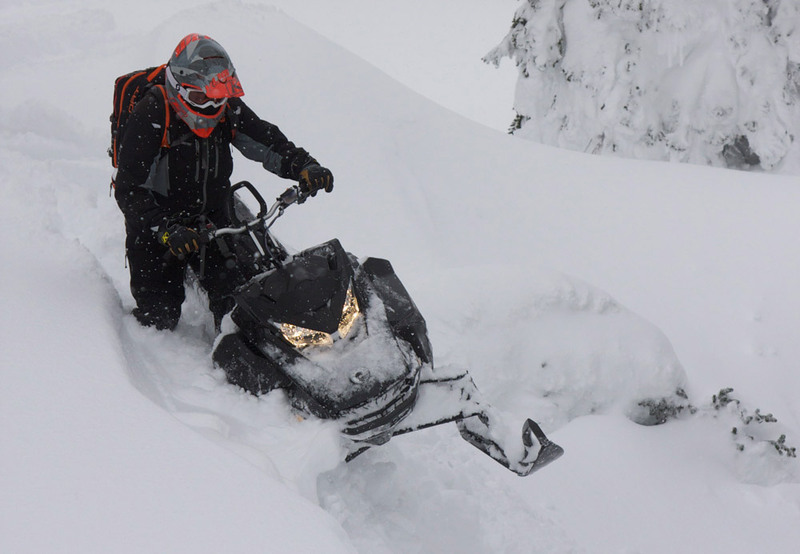 Refer to our many feature articles on Polaris’ 850 Patriot motor and the 2019 SnowCheck Select Pro-RMK 155 and 163. When we first rode Polaris’ 174 Pro-RMK we were mixed up as to its “flickability.” The 174 Pro-RMK is a planted snowmobile. With its length, the nose does not lift like the 155 and 163 Pros when snapping its throttle. 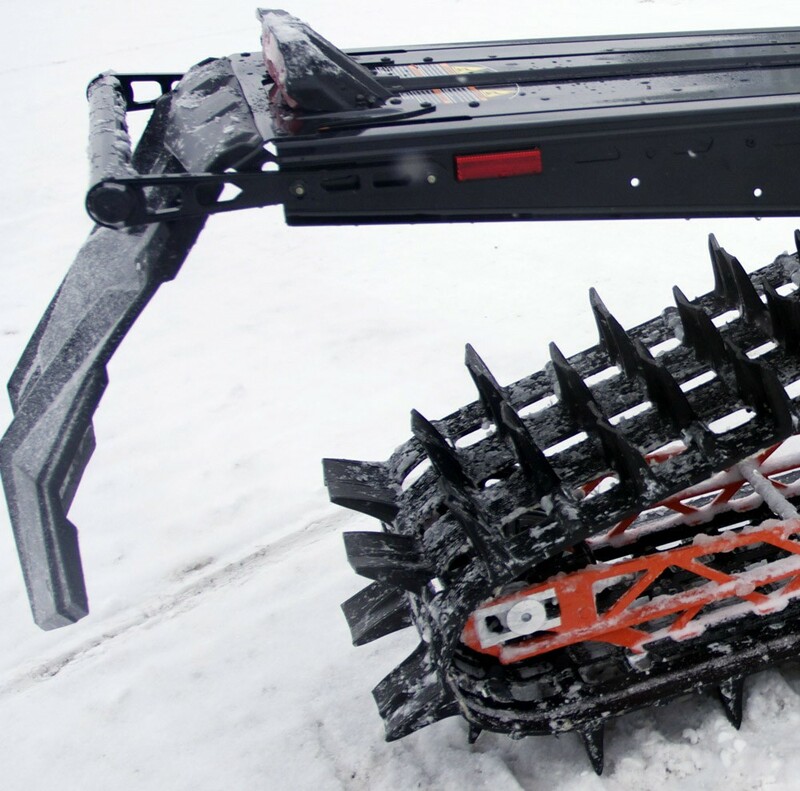 But, when slow log hopping in tight tree conditions, especially when the snow is deep, the 174 Pro-RMK stretches out and gives its driver the floatation to power along with no trenching, spinning out and being wild. If on a long day’s ride, when other riders are tired from digging out their 150s or 160s, the 174 Pro-RMK driver is fresh and young. Like the 155 and 163 Pro-RMK, the 174 comes with Polaris’ patented Lifted AXYS RMK chassis. The 174’s ridged rear suspension has for 2019, an “all new front track shock cross shaft which is 0.5 pounds lighter and a new, patent-pending hyfax design optimized for lighter weight while maintaining durability.” Wrapped around the suspension is the Series 7.0 3.0-inch paddle track which is a lightweight single-ply track that is durable and engineered for uber-deep powder performance. The Series 7 track with 3.0-inch tall paddles is shared with the 163 Pro-RMK. The track may not spin as fast the Series 6, but overall, it is perfect for the 174. The 174 is a chaincase driven Pro-RMK. Polaris feels with the long and tall track, the robust chaincase is best rather than the Low-inertia Quick Drive Belt Drive System. We feel the belt drive system can handle the load, but the company chooses to be conservative and trust its gut and give the 174 customer the most reliable drive system it has, though the belt drive system is tough. Up front, the 174 Pro-RMK 850 has the new 2019 AXYS Pro-RMK React Front Suspension, which delivers almost power-steering like control. The React front suspension substantially reduces arm and hand fatigue when rotating the bars, while delivering effortless and predictable control when boondocking and when laying into a sidehill. The previous years’ Pro-RMKs where effortless – so we thought – until the G4 Summit X came along, then effortless became buttery; Ski-Doo set the standard. The React front suspension makes the Pro-RMK silky smooth and graceful. With the React Front Suspension, Snowcheck riders can opt for a monotube Walker Evans shock with a coil over spring that is steel which is lighter and strong than titanium. This new front suspension has an adjustable 36-inch to 38-inch ski stance, a sway bar for predictable handling, new A-arms and forged spindles for strength and durability. The 2019 Pro-RMK returns with its traditional business office: Pro Taper bars with mountain strap and hooks, minimalist controls for heater, light dimmer, PERC and motor kill; and two choices for an instrument pod. We pounded these coil over shocks hard in February and March 2018, and the ride and control these deliver are phenomenal. These coupled with the new React front end and twin rail RMK skidframe, the Pro-RMK 174 is gentle yet aggressive, determined so to be. Are we progressing to become 170-plus riders? We are. It may have to do with age creeping up on us, or the fact the AXYS RMK-chassis Patriot-powered Pro-RMK 174 for 2019 is just that good. When you think the 175 is about to give in, it will not. The wide 16-inch track, the motor and drive system and the wide-spaced track lugs, make the 175 Summit X the powder master it is. 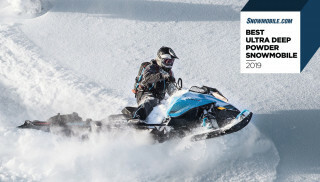 The 2019 Ski-Doo Summit X 175, especially one equipped with the splendid SHOT – Start Hot – is a super long, long track snowmobile that mountain riders should consider for the upcoming 2018-2019 winter season. 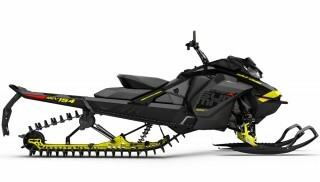 The 2019 175 Summit X has Ski-Doo’s 16-inch wide Powder Max II track that is a 3.5-inch pitch track; it has Ski-Doo’s proprietary FlexEdge technology. The track’s paddles are spaced such that it does not cut and blow out the snow. This track has a total footprint of 2800 square inches. Being half the track is on the surface at all times, 1400 square inches of track with three-inch paddles propels the 175 Summit. The 2019 175 Summit X with 850 power gives riders a motor with a wide powerband and bottom-end grunt. The 175 Summit X will hold its torque down low for those times when you need to creep up a steep slope or through narrow-spaced trees. Working with the track to keep it positive, is Ski-Doo’s famous tMotion rear suspension and FlexEdge track. After spending several days aboard the 2019 Summit X 175, the 175 can lift its nose and pack its skis like a 165 Summit X. Its stout motor will pack its skis, but not like a 165. Furthermore, like any smart owner with a smart mountain snowmobile, adjusting the rear suspension to body weight, terrain, and snow condition is key to smart riding. Want more lift? Dial it in. What less ski lift? Dial it out. Riders who accept “average” suspension settings are only experiencing an “average” ride. 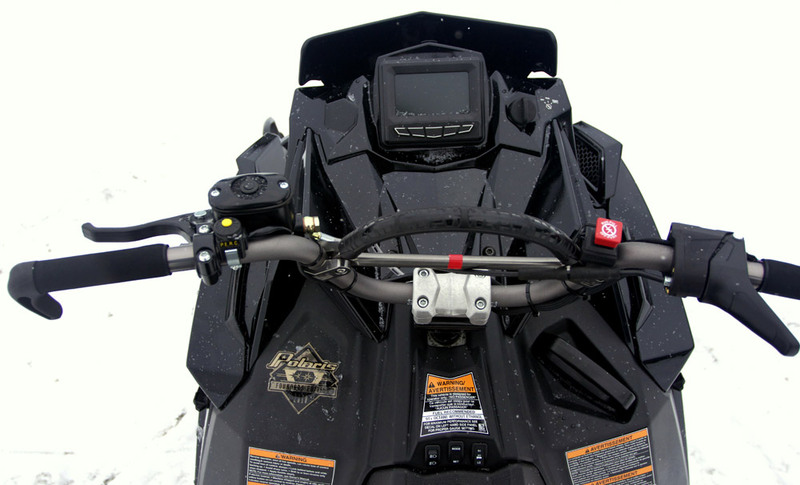 A narrow cockpit is all business with the 2019 Ski-Doo Summit X 175. The 4th Generation REV chassis is what makes the G4 175 the success it is. At all shock points, the 175 Summit X comes equipped with HPG Plus coil over shocks. We like these for their adjustability and control. Ski stance for the 175 is an adjustable 35.8 inches or 37.4 inches. 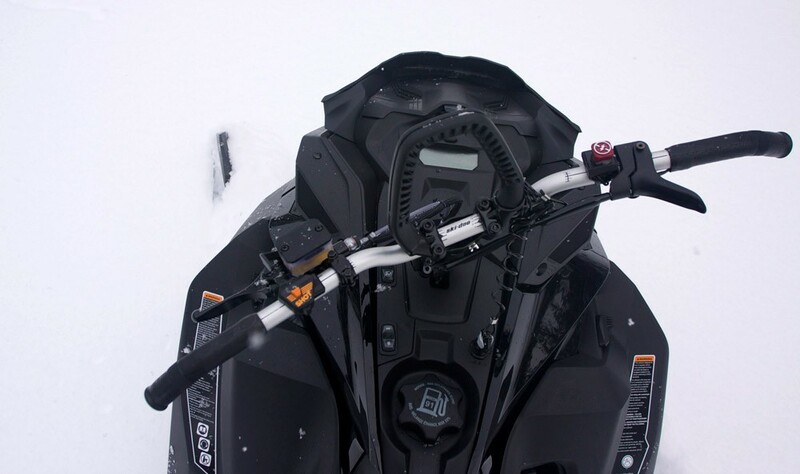 When Ski-Doo built its 175, it believed it needed to spread the tMotion rear suspension’s scissor and mounting points, lengthen the torque rods, add a longer front rail shock, and lower the skidframe’s mounting bolt positions (on a longer mounting plate) to the tunnel to give the long track flotation, a 165-like turning radius and 165-like agility. Ski-Doo just didn’t take the 174 XM Summit X tMotion and stuff it under the 175; the rear suspension, as of 2018, is all-new for the 175. Slipping off a cornice or a hillside in a 175 Summit X, is no different than making a drop on a 165 or 154 Summit X. The Gen4 chassis allows riders to, easily, set the 175 on edge and power down. For Rocky Mountain boondocking and hill climbing, the 2019 Summit X 175 will ascend to dizzying heights, float atop the deepest powder, and carve Figure-8s with a feathery touch to the bars and minimal pressure on the boards. We when rode the 175 Summit X next a 165 Summit X, the 175 does involve slight more effort to drive than the 165, but only if you are looking for it. The 175 Summit X feels 165-like, more than the 174 Pro-RMK feels 163 Pro-RMK like. The 175 Summit X for 2019 is feathery light through the bars. 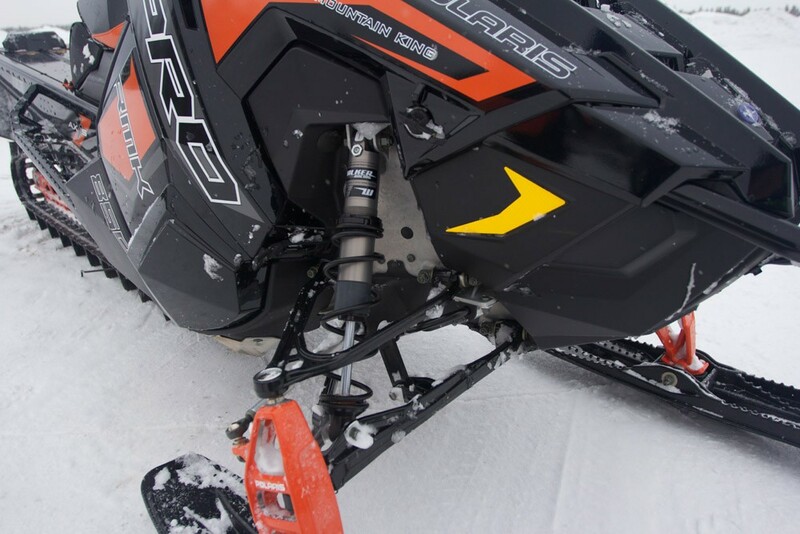 But we must add here, the new React front end on the Pro-RMK 174 makes the Polaris super long track snowmobile on par with the 175 Summit’s handling. 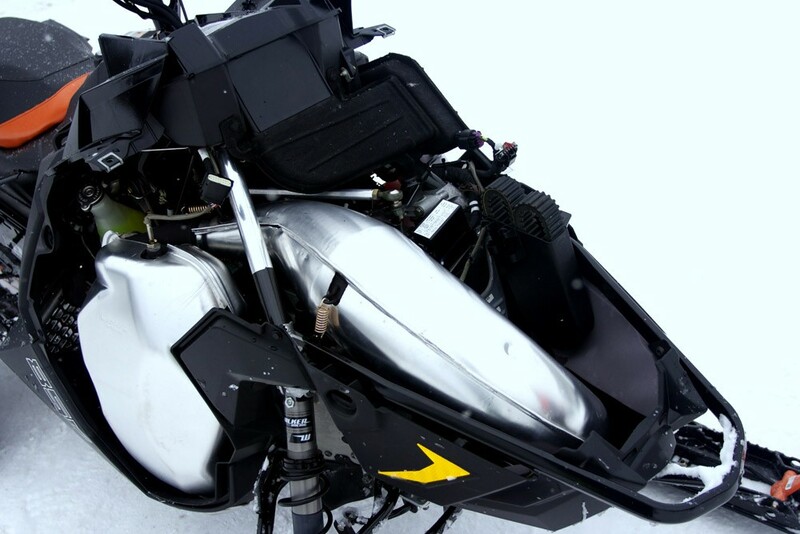 The 850 Ski-Doo motor is not one to weaken in high altitudes. With a throttle snap, and some bad attitude, a driver and his or her 175 Summit X and launch and laugh. Customers can order, or did, their Spring-buy Summit X in either black, or Ultimate Lava Red, or Octane Blue and black. SHOT is optional, but choose it. The three-inch Powder Max II track is the only track choice for early-buy Spring order customers. The ultra-long 170-plus snowmobiles allow us to traverse deep and tall mountains that very few can; and what a thrill that is. 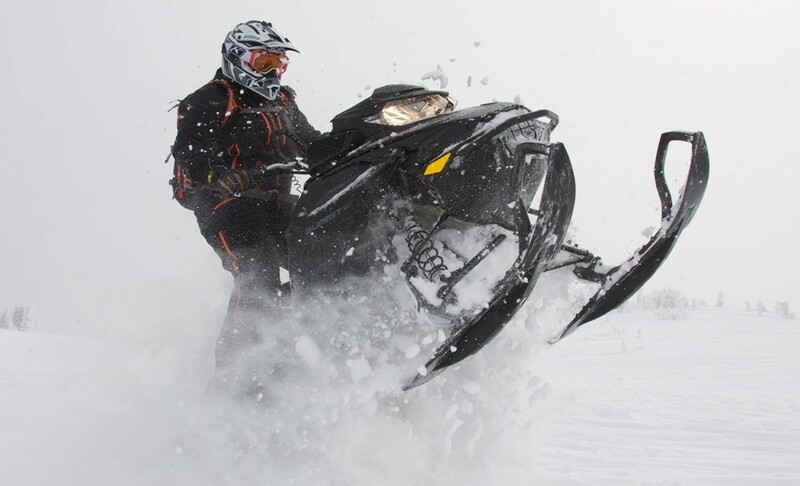 We love these super long mountain snowmobiles for the freedom they provide. What about Arctic Cat? Will Cat build a 175 Alpha One or Mountain Cat? From our view, probably not. The way the 165 Alpha One behaves in deep powder with its Alpha single rail rear suspension, there is no need for a 175 Arctic Cat. The Alpha One floats like that of a 174/175. This is a no BS statement. 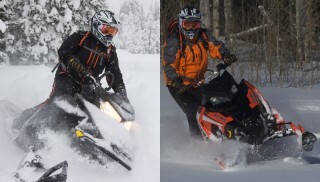 The 850-powered 2019 Pro-RMK LE 174 and the 2019 850-powered Gen-4 Summit X 175 are fairly nimble, given each snowmobile’s respective chassis. As age continues to challenge many mountain riders’ personal agility and nimbleness, a mountain sled that is planted, that floats, and one that stays tied to a mountain’s side during long sidehill sweep, is not a bad thing. How do these compare to each other? The Summit X 175 feels just a wee bit more lively, less planted. If more ski pressure is given to the 175 Summit X, it will behave like the Pro-RMK 174 — planted. Conversely, the 174 Pro-RMK can be set nose light as well and be as a lively as the Summit X. Both are similar in handlebar effort, initiating a sidehill and in motor-power. Both do not “panel-out” on a sidehill cut and deliver a predictable and stable ride.